I liked the pattern SO much and decided to make it in two different yarns. So far, I have knit both sleeves. But even that was not without its problems. After I got word back from Yarnspirations with the assurance that all errors for all sizes had been rectified, I went ahead and knit both sleeves. They worked out fine and the chart for the sleeves was fine too, for the Size M, which is the one I’m making. I am now working on the body of the sweater, which is knit in one long row across, on circular needles. A lot of stitches, over 200, but no side seams required, when it’s made this way. I got the ribbing and the plain stockinette area at the bottom of the sweater knit without any problems. Now, I don’t know what to do. as I said above, I’m NO expert when it comes to knitting. I can follow a pattern just fine but I expect that pattern to be correct and not one I have to figure out along the way, when errors come along. Aren’t these patterns made (IN ALL SIZES) before they are posted, on major sites like Yarnspirations? Based on this and other experiences with other major pattern websites, that is sadly not always true. If there are any knitters out there reading this who like a challenge and have a bit of time, I’d REALLY appreciate your opinion if this body pattern chart is actually correct in the Size M? You can download the (updated/corrected??) pattern here. I don’t want to start this pattern again without being sure that it is correct, this time. Frogging small stitches like this, on a circular needle and over 200 stitches is NOT MY IDEA OF FUN KNITTING!!! I hope your own knitting and craft projects are proceeding faster and more smoothly than this one has been for me. 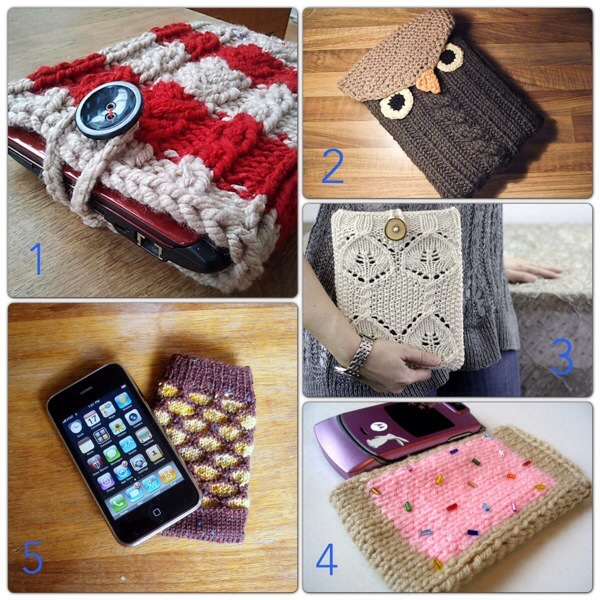 I still ♥ to knit but I could do without errors in patterns!!! A Big THANK YOU in Advance to Any Knitters Who Have the Time/Inclination to Check Out this Chart and Give Their Opinion If/Of What’s Wrong. You can leave a comment below or email me (see contact page). 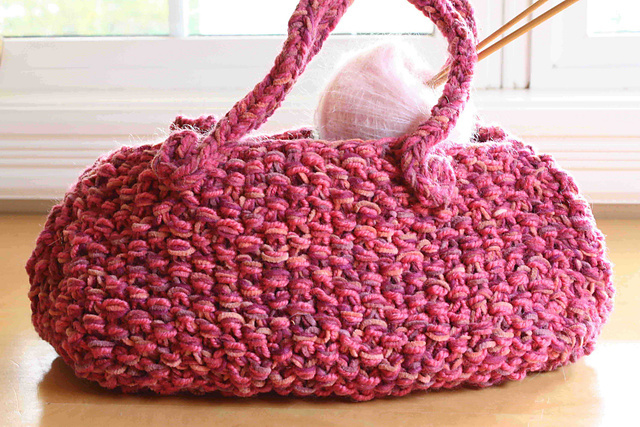 I had a browse around Ravelry a couple of weeks ago, looking for ways to use up my own stash and found these two lovely tote patterns, one crochet and one knit. Thanks to designer: Kathy North for allowing me to share the photo and pattern of her Stash Bustin’ Tote, pictured above. The other stash-busting tote that I really liked, was this one: Girl About Town, designed by Joanne Yordanou. This one is knit and again, an easy pattern that would ideal for beginners. 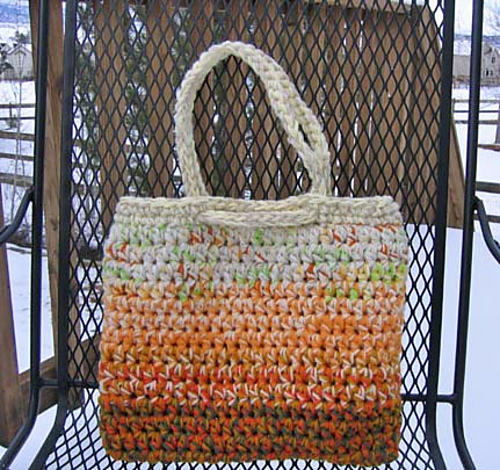 Thanks Joanne for allowing me to share your tote pattern/photo here too! Both of these patterns are currently free, so it’s a great time to download copies for yourself! 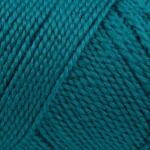 Ravelry is so amazing! So many talented designers over there, sharing their work, often for free or for a very nominal charge. I ♥ it! I hope to make one or both of these soon. I NEED a new tote bag, badly!! Want to Make Some Gifts for Valentine’s Day? 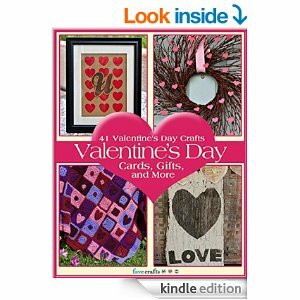 I found this eBook over at Amazon today, with 41 assorted Valentine’s crafts, for the whole family to make. 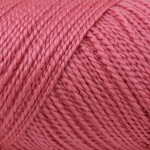 Included in this collection is a lovely Valentine’s Day Shawl (crochet). I think it’s so special to make gifts for those we ♥. Even if it’s just a special cake or card, if it’s made with ♥ and comes from the heart, it’s worth more than any store-bought gift could ever be. Are you planning to make any gifts for Valentine’s Day? 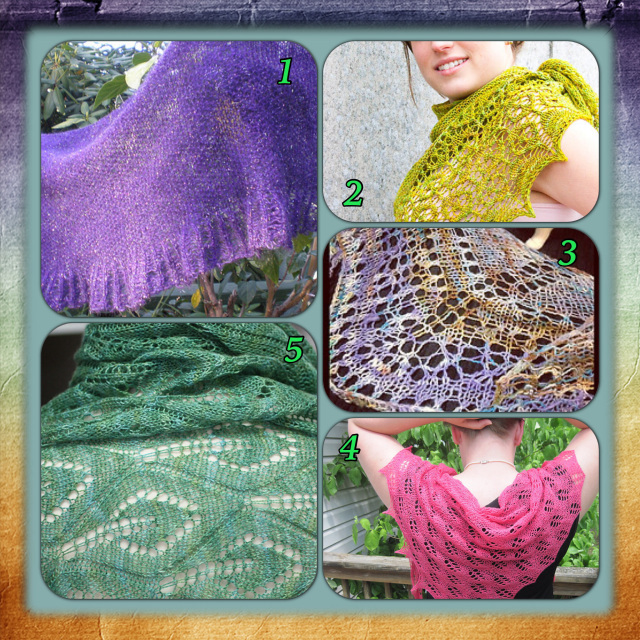 I ♥ shawls and have several knit and crochet ones that I’ve made over the years. Are you a fan of shawls? Have you made any recently? THANKS TO THE FIESTA CAT YARN CO. FOR THESE PATTERN LINKS. AREN”T THESE WONDERFUL? I WANT THAT OWL ONE FOR MYSELF. Available for free right now,don’t know how long that will last. It’s in the top 100 free Amazon ebooks. Click to read more here, including the link to the ebook. 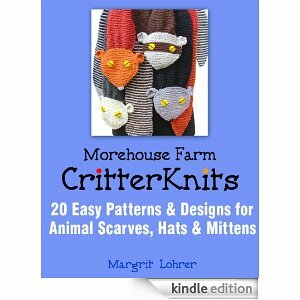 Looks like a whole lot of knitting fun for critter-lovers who knit. Like me!